As is the convention at VIDYA Mumbai, this year also witnessed extensive planning and active participation from VIDYA staff and students in the Standard Chartered Mumbai Marathon 2015. Forty students and 5 teachers took part in this exciting event. The 42 kilometere full marathon/21 kilometer half marathon was the culmination of a great deal of enthusiasm, excitement, hard work, dedication and passion. The preparation for the event began many days before the marathon – about 8 months prior to be exact! Activities such as reaching out to donors, selling the bibs, picking and distributing the bibs and goodie bags, raising pledges, nominating the VIDYA contingent for the run, preparing placards and getting t-shirts printed to proudly proclaim VIDYA’s 30th year all lead up to the happy day. Everyone involved was enthusiastic and ecstatic about it! 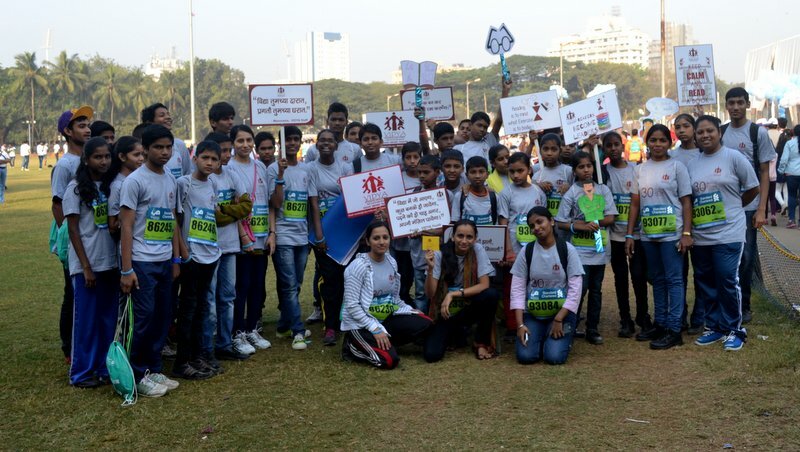 The theme for the Mumbai Marathon endorsed by VIDYA this year was ‘Run to Read’ in order to spread awareness and help inculcate the habit of reading. Students and staff had prepared a big book of a poems written by Jayshree Murali, titled ‘Lets Run to Read’. Placards portraying thoughts on ‘reading’ depicted through Warli (courtesy – of our overseas volunteer, Maria) and quotes by VIDYA stakeholders on the impact of VIDYA were prepared and carried by participants. The Mumbai Marathon Dream Run began sharp at 9.00 am on 18th January 2015. The children, after clicking beautiful pictures, marched towards the entry point at Chatrapati Shivaji Terminus shouting slogans of ‘V for VIDYA’ and ‘Let’s Run to read’. They proudly carried the placards and puppets made by them. The children were excited to see the colourful and energetic atmosphere. They were happy about running with other children as well. 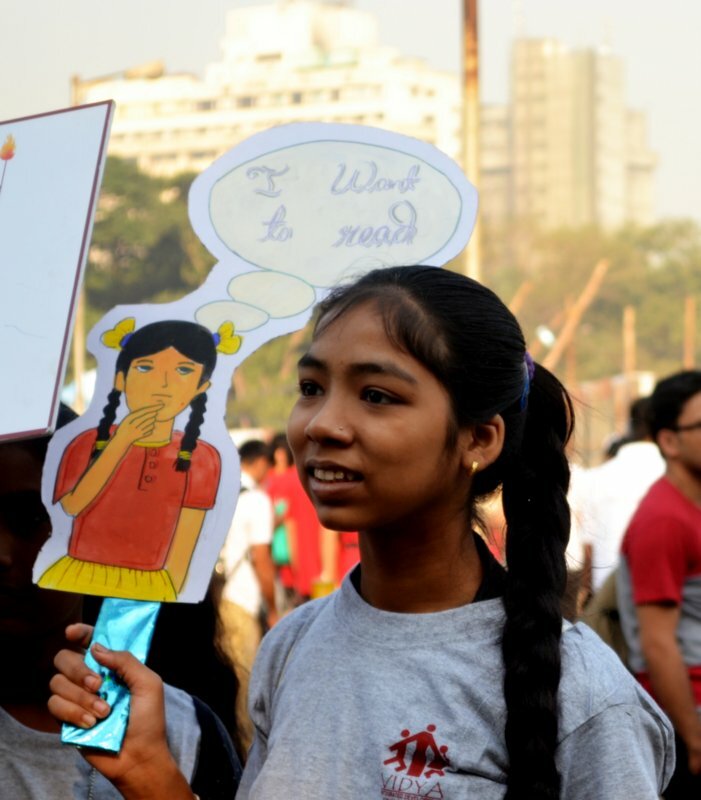 Chanting the slogans and proudly holding the placards, the VIDYA contingent displayed exuberance all through the walk. They were inspired by the senior citizens and the differently able, who walked shoulder to shoulder with them. The children cheered runners of the full and half marathon who passed. The youth were particularly inspired by the runners – quite a few said that they would like to run the half marathon next year. They also saw the Chief Minister of Maharashtra, Shri Devendra Fadnavis, who had come to cheer the participants. They were elated to see the Arabian Sea and the magnificent view of Marine Drive. It was a different world and experience for the VIDYA children. They rested by the sea and soaked in the beauty of ‘Real Mumbai’. On their way back, they danced to the tunes and bands of the Navy and CHIP Mumbai participants. The children were awed by the pyramid dance showcased by one of the organisations and also suggested that they would like to do something similar at VIDYA during one of the events. Thus the day ended on a great note and the whole group enjoyed the event immensely. VIDYA is thankful to veteran Marathoner Pradeep Deshpande who ran in support of VIDYA for the 5th year in a row. He completed the half marathon in 2 hours 3 minutes. Also our sincere thanks to G.P.Roa, AirIndia, Anshuman Gupta, Chirag Pathak, ICICI Pru, AMC, L&T Finance, Capita and Tejas Gupta, Jayshree Murali, Rajanikant Doshi, Namrata Bhosale, Vaishali Doshi, Shweta Bangera, Aarti Patil, Meghana Jadhav, Preeti Nair, Fiona Fernandes and Vinita Ramchandani for their support through Corporate Challenge and individual bids.